Aquaflor's Sileno Cheloni performs essence-burning ceremony for Invisible. Presenting 'Invisible', the perfume, as it goes skyward. Aquaflor created AWA's new signature fragrance as a tribute to Florence's forgotten women artists. Aquaflor's master perfumer Sileno Cheloni performs an ancient ritual revealing the origins of the word 'perfume'... scents released into the Universe by burning. 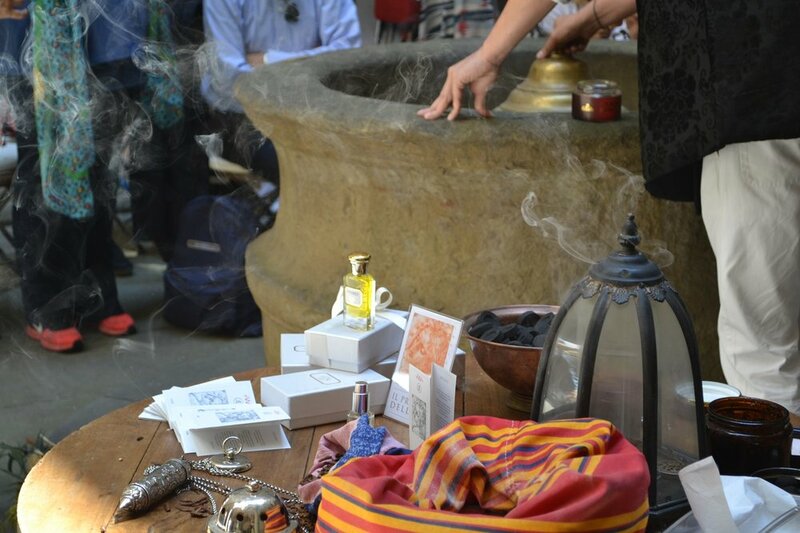 This essence-burning ceremony held at a press conference for Lifestyle and Fashion journalists allowed members of the press to experience 'Invisible' 'first hand'. Here's a description of the fragrance in Sileno's own words, "evocative floral hints, top notes of lemon leaves and violet, an accord of jasmine and osmanthus. Its end notes exalt the decisiveness of the iris and the absolute preciousness of the rose." AWA celebrates the first day of Summer, June 2017… with a perfume inspired by creativity's deepest values: desire, memory, yearning, intuition. Proceeds from 'Invisible' support the restoration of art by women in Tuscany.